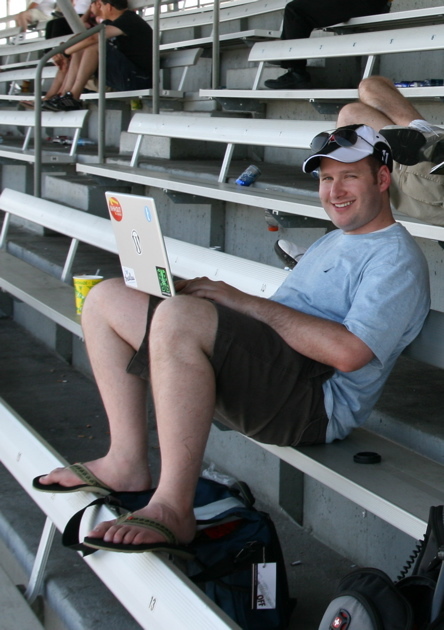 Any WordPress users at the US Formula One Grand Prix this weekend? If so, I thought it would be neat to meet up and watch either the morning practice session or qualifying tomorrow (Saturday). For the morning practice at 10AM I was thinking about finding a seat in the grandstand at turn 10. For qualifying at 1PM, I think across from the Ferrari pits in the upper section is the place to be. Last year there was some exciting action at the beginning of qualifying. Here is a link to the track map. If you are at the race and are interested in meeting up, please leave a comment and we can rendezvous just before the sessions start. And yes, the picture below is me typing this post at the circuit… I wouldn’t have it any other way. Toni found this awesome Shell commercial that covers the history of Ferrari F1 cars in 120 seconds. This comes just in time for the 2007 Formula 1 season which began last week with a victory by Kimi Raikkonen in his new Ferrari drive. I will be at the US Formula 1 Grand Prix this year in Indianapolis and hope to make one more race, although not sure which one yet. Right now the German Grand Prix looks promising… Anyone planning on attending any Formula 1 races this season? Which one(s)? UPDATE: It looks like they took the video down, but if you really want to see it, leave a comment and I will send you a link.